Power Rangers did not grab me immediately. At my age I don’t identify or care about the characters, I don’t leap around pretending to fight hordes of this week’s bad guy in my colourful costume. I own none of the toys. I’m not particularly troubled by the angst of the Red Ranger. I’ve barely watched a single episode of the twenty or so seasons since the series landed on these shores. But then, I’m only the guy who pays for the game; I’m not the person intended to play it. 7th Chord know what their target audience are looking for and bring it all together in a package that pays tribute to the history of the Rangers and wraps it up in a simple to access sideways scrolling beat em up. 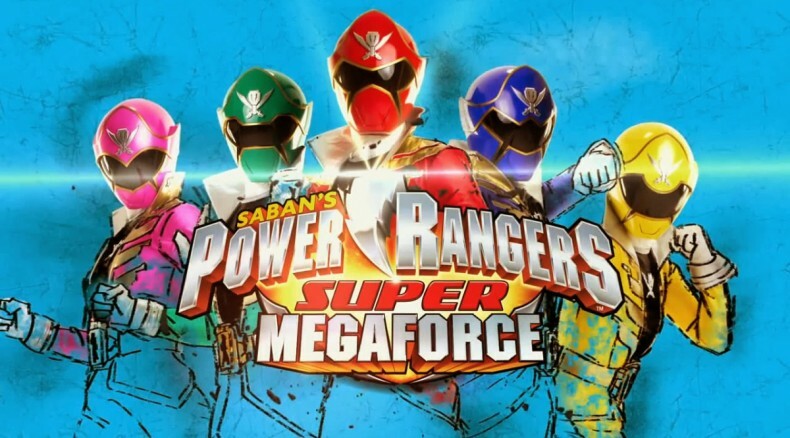 You start off with a choice of six of the current Rangers, each with their own abilities, and even the signature weapons they use in the series. As you play through the game, you’ll be given the opportunity to unlock other Rangers – up to a generous thirty, each with their own signature weapon. You can also unlock extras by using ‘Ranger Keys’ that are sold separately and can be scanned in using the 3DS’s camera function. It allows to avoid some of the occasional grinding that is required. New rangers give you new skills which in some levels allow you to break down walls in the scenery to find secrets. It means revisits to levels are sometimes a necessity on the path of completion. Revisiting levels is no bad thing anyway, as you are given the chance to earn more experience to level up your characters as you play. This diet-RPG element certainly helps increase the game’s longevity; I could certainly see my son playing for hours unlocking all the characters, before spending even more time levelling them up. You also have the chance to collect coins to buy additional equipment and items. 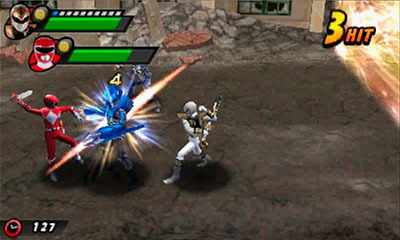 At the beginning of the level you get to select which two Rangers you will use for that level with you being able to control only one of them. Different Rangers will have different powers, e.g. the ability to heal if you are the Green Ranger. This power becomes useful because if your partner loses all of their health during the level, then you both lose. It really adds a layer of tactics in what could be a simple button mashing affair. You also have the option to select whether your cohort will stay defensive or attack out right, which again is a very welcome addition to what could have been a tired formula. You will regularly come up against the standard boss character at the end of stage five, before facing off against them in Megazord from in Stage Six. I had a lot of fun with these final stages, let alone my son. 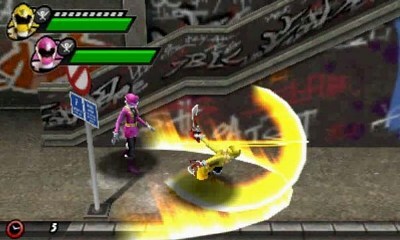 The controls move to the touch screen where you have the choice to use three different attacks , then at a certain point go for a finishing attack that requires a combination of moves in order the land the final destructive blow. With ten six-stage levels to play through, there really is a reasonable amount of content to keep your child amused. There is also the option to change the difficulty from very easy to hard, so it makes the game accessible to those who want to play through for the experience instead of the challenge. The hard level with give even an experienced player a decent challenge and again reinforces that this is a game about longevity as well as just a simple cashing in on a brand. The character model of each Ranger is well represented. The backgrounds in which they fight are less inspired, however, and come over as bland, which is a shame considering the work that went into the characters. The whole game is a large pile of harmless fun for a saturday afternoon when nothing much needs doing. If you’re a grown-up fan of the series, then this is the game for you. You will have played the previous games in the series and will be more than happy to accept the shortcomings that this type of game may bring, but you’ll also be happy to see the extra Rangers included to flesh things out and add value. Power Rangers really comes into its own when it’s in the hands of the demographic it was intended for. It’s a game that is expected to be played again and again for every collectable and unlockable Ranger available. My son didn’t have an issue with the backgrounds, he was too busy fighting as Red and Blue Ranger. He didn’t mind going back to collect more and more experience, because it allowed him to level up all his characters as far as he could take them. He was willing to play again and again without complaint because he was having a whole lot of fun doing it. 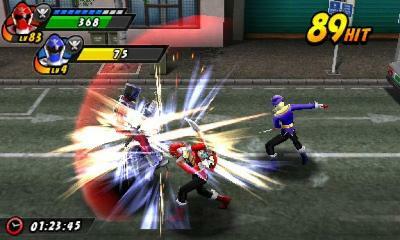 A decent side-scrolling beat 'em-up, but one that's definitely aimed at the younger audience.